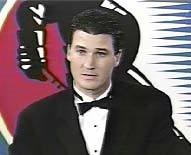 (TORONTO, November 17,1997) � The 1997 Hockey Hall of Fame Induction weekend proved once again to be a resounding success. Bobby Hull kicked off an exciting four days of activities by signing autographs on Friday, November 14 from 2:30 p.m. to 4:30 p.m. The first snowfall of the season did not deter the many fans of one of hockey�s greatest scorers of all time. Hull scored 610 goals and in 1965-66 his 54 tallies made him the first player to exceed 50 goals in a single season. His admirers lined up around the perimeter of the WorldCom Great Hall and down the stairs into the main exhibit hall. Saturday was Esso Hockey Heroes Day featuring a host of events. The first 1,000 guests received a1998 Hockey Heroes calendar compliments of Imperial Oil/Esso. As a salute to inductees Mario Lemieux, Bryan Trottier, and Glen Sather, the Esso Theatre screen was filled with images of the Stanley Cup triumphs of the Pittsburgh Penguins, New York Islanders and Edmonton Oilers. In the Arena Zone, the Ford Trivia Hockey Challenge allowed fans to test their knowledge, with copies of the five-part Legends of Hockey video series up for grabs. The Rink Zone was filled with the Skills Challenge, whereby fans played the interactive games for a wide variety of prizes and food coupons. Maple Leaf Gardens was abuzz with excitement prior to the opening face-off of the game between the hometown Leafs and visiting Pittsburgh Penguins. 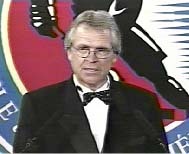 On Hockey hall of Fame Night each of the 1997 inductees was introduced to a cheering crowd. The loudest ovation was reserved for Mario Lemieux during an emotional moment for each of the nearly 16,000 people in attendance. Sunday gave people a chance to meet their Hall of Fame heroes during an exclusive autograph signing session from 2:00 p.m. to 4:00 p.m. in the Verizon Great Hall. Anxious fans formed one of the longest lines since our grand opening in 1993. It was an exhilarating afternoon for everyone involved. Induction day began with the unveiling of the Inductees� Exhibit at the main entrance of the museum. These cases featured several new donations from the newest hounoured members such as Lemieux�s jersey from the 1987 Canada Cup. The traditional luncheon started at 11:30 a.m. during which the three inductees received their Hockey hall of Fame rings and blazers. This was followed by the presentation of Foster Hewitt Memorial Award and blazer to Gene Hart and the Elmer Ferguson Memorial Award and blazer to Ken McKenzie. At the conclusion of the luncheon the inductees and media ward winners were escorted to the Verizon Great Hall for a press conference and photo session with the media. At 4 p.m. the Fan 590 brought the Induction Gala preparation and excitement to a vast audience of radio listeners. Over the next three hours guests and dignitaries arrived in anticipation of the Induction ceremony, which began at 7:30 p.m. It was an emotional hour for the inductees and media award winners along with their loved ones in attendance. 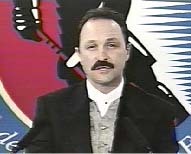 The Hockey Hall of Fame Induction Ceremony was broadcast on TSN and ESPN before a continent-wide viewing audience. At the conclusion of the ceremony, the Gala began with food, drink, and conversation for everyone. The annual silent auction began in the Rink Zone with bids accepted on such items as autographed Mario Lemieux Induction jerseys, travel packages to the 1998 NHL All-Star Game in Vancouver and autographed memorabilia from several different sports. Congratulations to the Class of 1997 and to everyone who worked hard to make the weekend so enjoyable.